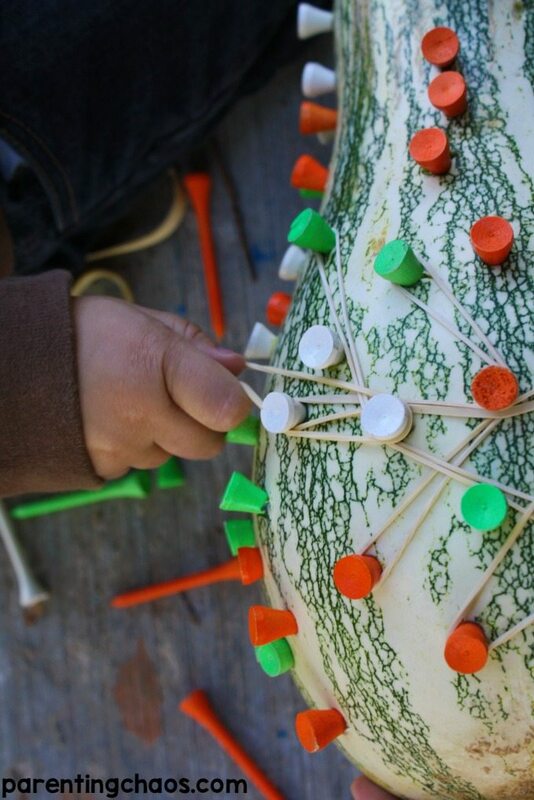 Needing a simple afternoon activity to do with your kids? 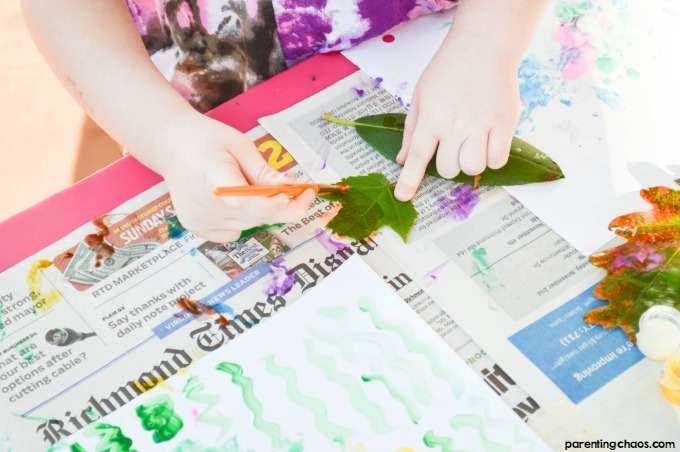 Then you need to give these Leaf Prints a try! 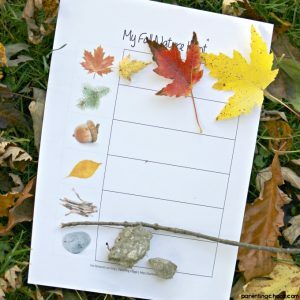 My kids had a blast going on a nature hunt and then getting messy with this simple process art activity! The girls and I have been taking advantage of the recent beautiful weather to play outside more often. It’s been unseasonably warm here lately and we’re loving it! We went on a leaf hunt this weekend and filled up one of our Halloween buckets with a bunch of different leaves. We’re super lucky with our yard; we’ve got a great mixture of mature trees, including oaks and maples. There are also a lot of smaller trees and bushes, but the oaks and maples are the only ones I know for sure. We collected leaves of varying shapes, sizes, and colors. A few of the leaves we got had fallen from the trees but had yet to get dry and crunchy; those were great to work with. We had a blast. 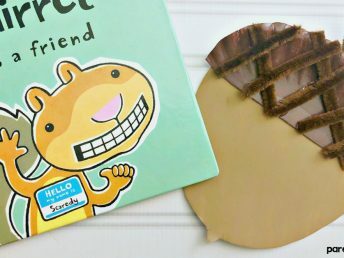 The girls got messy (but a washable type of messy), and got to do a super fun and easy craft. 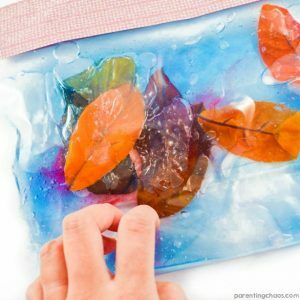 One of the greatest things about leaf prints is that you can do it 10 times and make 10 unique masterpieces! Step 1. Collect your leaves. 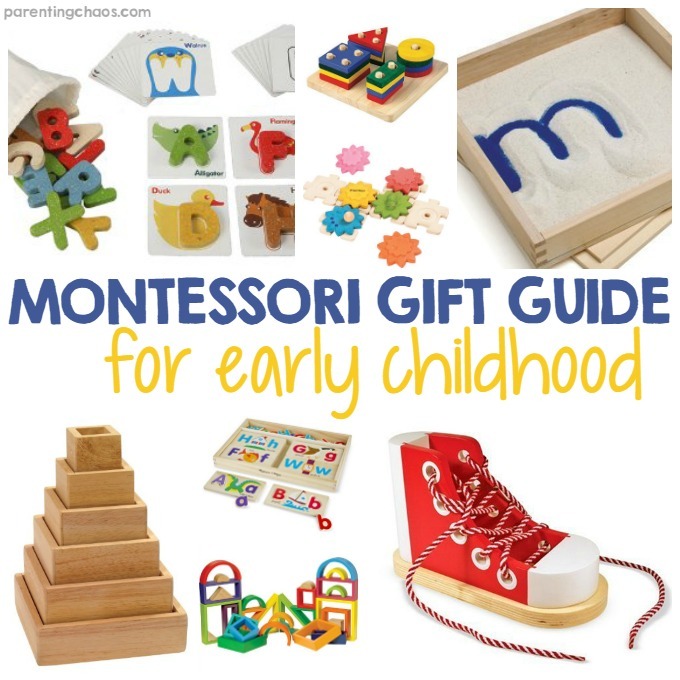 Try to get a variety of sizes and shapes, as this will help make more interesting patterns. Step 2. 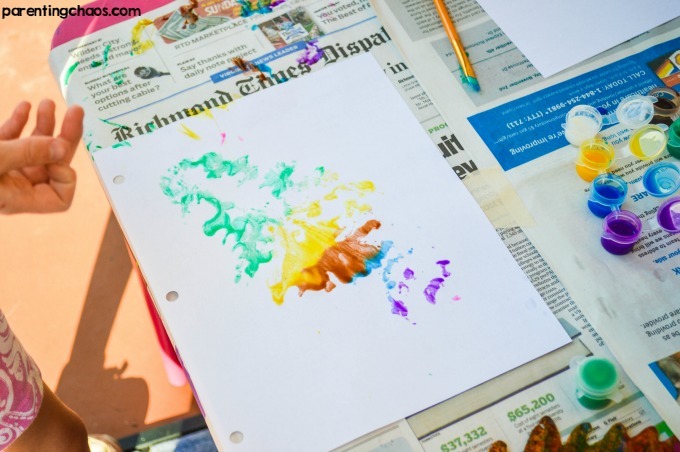 Check out your first leaf and paint one side of it. The easiest way we’ve found to do this is to put a layer of newspaper on the table and use that area to paint. 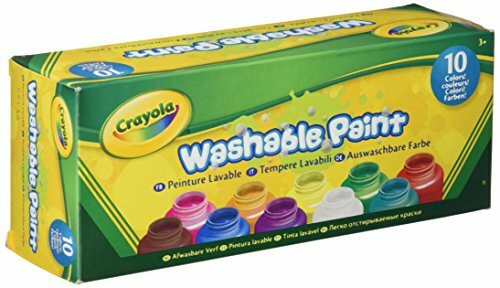 That way, you can paint all the way to the edges without stressing about getting paint everywhere. I’ve also found it to be helpful to have a large cup of water on hand to rinse the brushes when necessary. Lexi immediately started on her biggest leaf, as I had suspected she would. Many different colors went on this one leaf she declared to be her “rainbow.” Big surprise, Audri decided to do the same with her big leaf. Step 3. 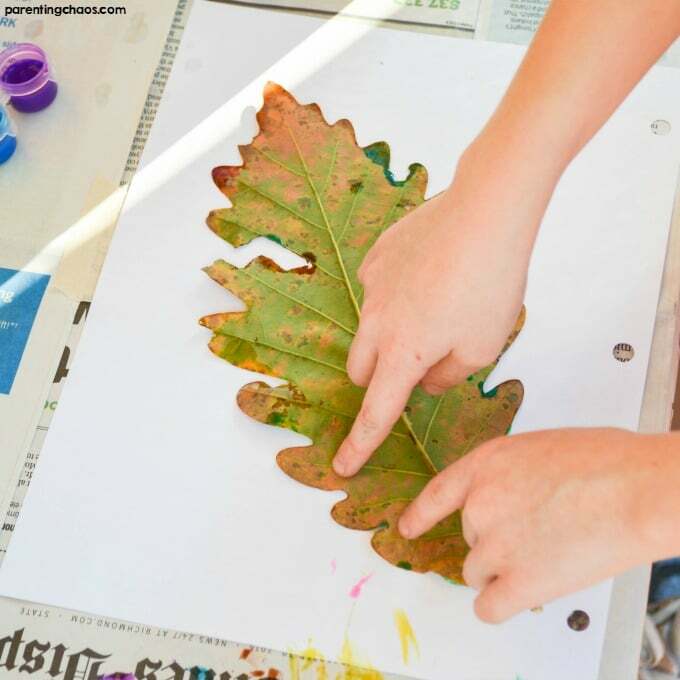 Carefully press the painted side of the leaf onto the paper. 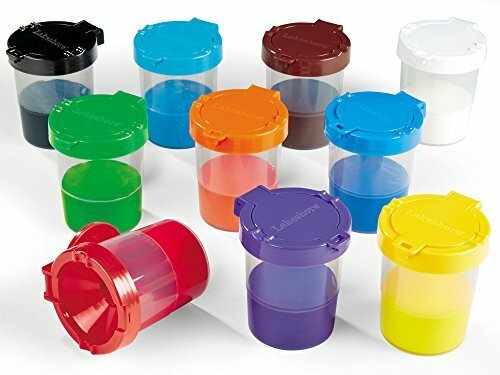 Make sure you’ve pushed it down all over to get the entire thing. Peel it back to unveil your new leaf. Step 4. Repeat until you have your perfect new image. Lexi spent a great deal of time painting her big one, making sure to get the entire thing covered. 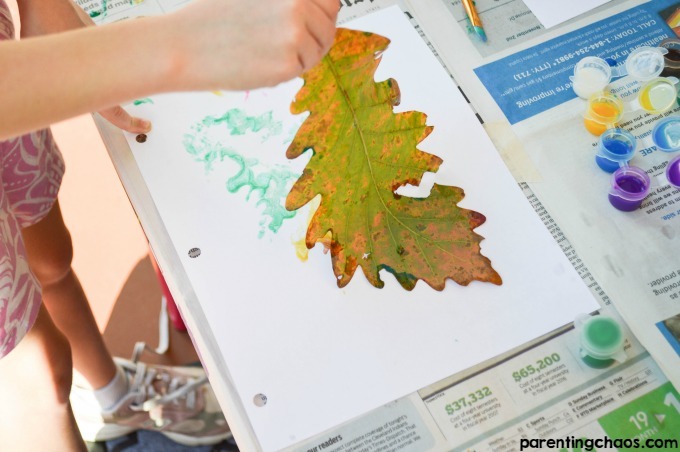 After it was done to her satisfaction, she very carefully pressed the leaf paint side down on her paper. Slowly peeling it back up, she revealed a very cool design left on the page. Audri was just as careful with her leaves, although not nearly as particular about her color choices. Some leaves got the rainbow treatment but most were painted with one color only. Every leaf press and reveal was exciting for her! She took her time and made it through almost all her leaves before realizing what Lexi was up to and jumping ship along with her. Lexi had done very well with the first leaf print and then deviated completely from the craft. Ha, this happens often with her as her artistic side takes over. She decided that instead of continuing with the leaves, she would just finish out the rest of the page on her own. Both girls did a wonderful job and we’ll be framing our new artwork. 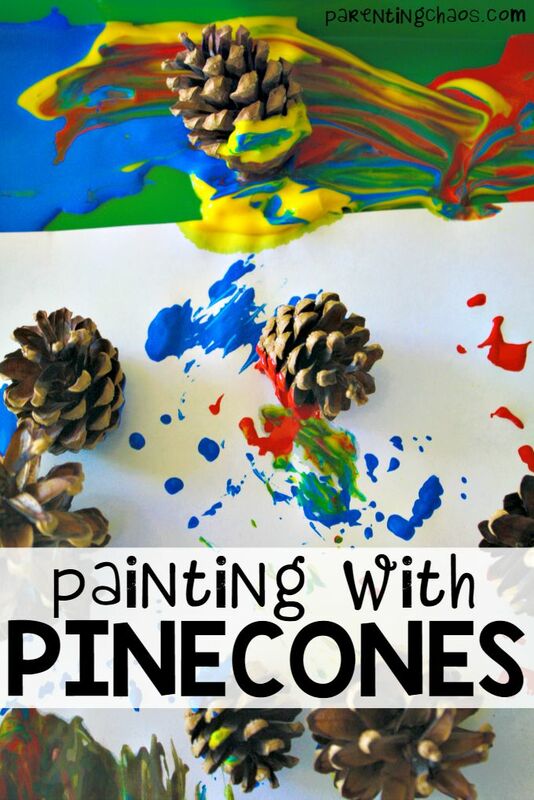 Lexi’s new idea is to get pine needles and paint with them so we’ll see how that goes! 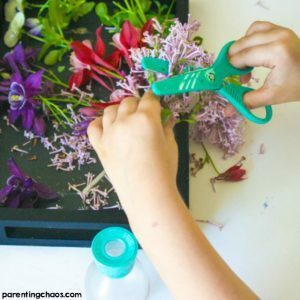 More Ways to Play with Nature! 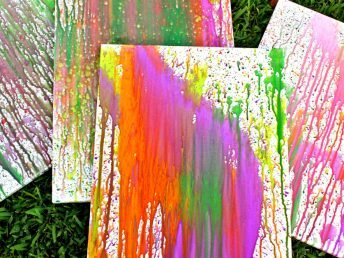 Water Gun Squirt Painting – Outdoor Process Art Fun!